Unintended consequences can wreak havoc on a company. Richard Franzi will share examples of well-known companies who have experienced unintended consequences from business decisions, including Coke, Walmart, Wells Fargo, Volkswagen, Martha Stewart, Kodak, and Pepsi. Richard will speak on what happened, why it happened and what they could have done to better prepare. Attendees will gain insights on how to evaluate their own business decisions differently, as well as key strategies to help mitigate potentially damaging results from unintended consequences. 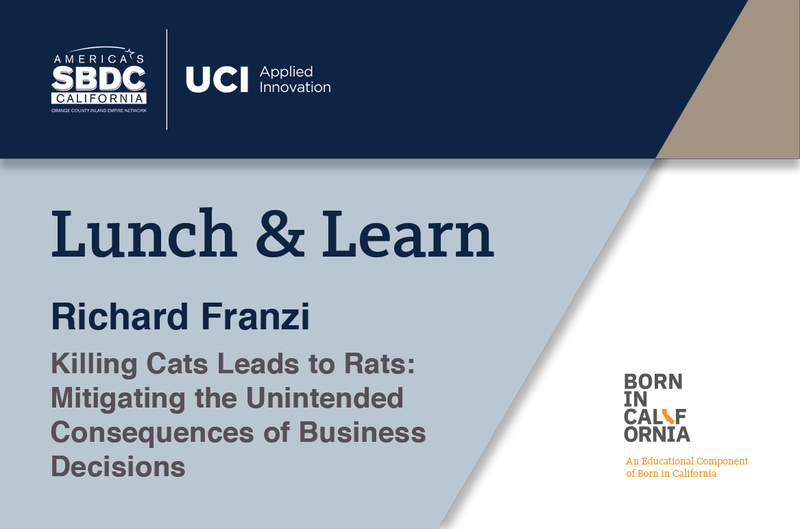 Richard Franzi is a best-selling business book author of Killing Cats Leads to Rats, published by Motivational Press in March 2018. Richard is also the author of the “Power of Peer Learning” book series, a radio talk show personality and founder/CEO of the Orange County-based Critical Mass for Business CEO peer learning firm. He received his MBA from Pepperdine University and previously worked at Delphi Connection Systems for 7 years as President and General Manager, where he grew the top line revenue 40% through product and market diversification. Prior to that experience, Richard spent 25 years as a sales and marketing executive for a variety of technology firms.